In 2012 Oki launched the first printers with white toner, the C711WT and the C920WT; color machines in which the black toner was replaced with white. Oki's latest innovation is the first 5-color LED-based printer. The ES9541 has striking specs which should appeal to a lot of printshops and repro departments which want to run short runs with features we have not seen before in this market segment. Essentially it is possible to swap out the fifth toner, and swap between clear gloss and white. This means the machine can print marketing materials with a gloss finish, or packaging prototypes with a white background, or adhesive transparencies for windows or bottles, or transfers for t-shirts etc. Running at 50 ppm onto normal A4 (28ppm onto A3) in four colors, this device can print onto 360 g/m² stock and onto banners up to 1.30m (over 50 inches) long. This product has a unique place in the market, the other machines with the option to print clear gloss being the Canon C1+, a multifunction with much lower productivity (14 ppm in color), and the high-volume Xerox Color 1000 digital press, which is in another segment altogether in terms of features and functions, and price. What is not clear yet, however, is how much the machine will cost to run. 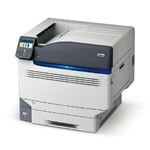 At the same time Oki are launching the ES9431, a four-color printer with similar characteristics to the ES9541. For instance it is possible to use an external EFI Fiery XF 5.0 RIP and up to five frontal paper trays with a total capacity of 2950 sheets.